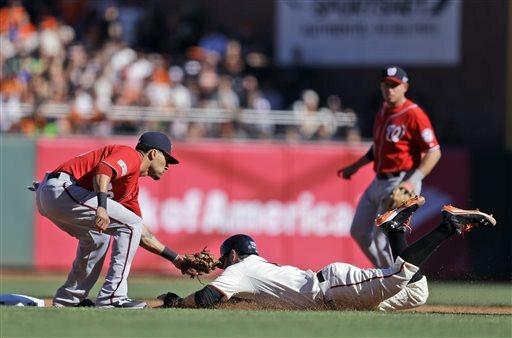 SAN FRANCISCO (AP) — Bryce Harper screamed out in delight as he crossed the plate with Washington ahead at last. After all those extra innings and a subdued cross-country flight, the Nationals had broken through — with a little help from Madison Bumgarner. Fister dazzled again in San Francisco, helping the Nationals cut their deficit to 2-1 in the best-of-five series. They ended the Giants 10-game postseason winning streak that started with Game 5 of the 2012 NL Championship Series against St. Louis. Washington scored two runs on Bumgarner’s throwing error in the seventh inning to end the ace’s 21-inning scoreless streak. Harper punctuated the victory with a solo homer in the ninth. Storen, the beleaguered closer who gave up the tying run in Game 2, allowed Brandon Crawford’s sacrifice fly in the ninth before finishing the 2-hour, 47-minute game. It was a far cry from Game 2, which took a postseason record 6:23. The pitcher had chances with the bat, too. He came to the plate with the bases loaded and two outs in the second to cheers of “Bum! Bum!” before striking out. Ryan Zimmerman’s health didn’t factor into Williams’ decision not to start him. Instead, some Nationals left-handed hitters had previous success against Bumgarner and the first-year manager wanted to put the best defense behind Fister. Zimmerman, recovering from a torn right hamstring, was 3 for 17 against Bumgarner. Posey is 3 for 14 (.214) against Gonzalez, while Sandoval is 1 for 10. The Giants are hitting .250 overall against the left-hander. Vogelsong has allowed the Nationals to hit .280 against him, with a .456 slugging percentage. Harper is 1 for 8 against the right-hander with four strikeouts. Span is 5 for 13 with two doubles and a triple against Vogelsong.